What Is DD Form 2536? 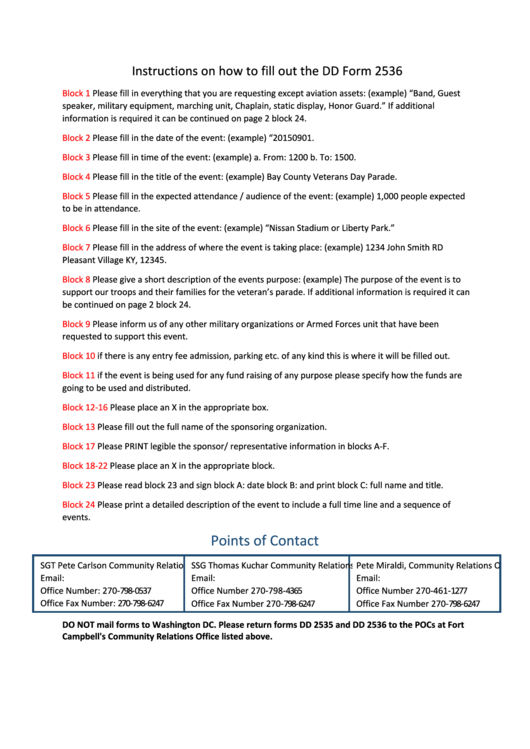 DD Form 2536 also known as the Request for Armed Military Forces to Participation in Public Events (Non-Aviation) is a document used to request Army musical units, troops or equipment for participation in public exhibitions. This form is used to evaluate the event to determine whether or not it complies with Department of Defense policies and to coordinate the units evolved. Musical units may accompany ceremonial and recruiting events or patriotic ceremonies but are not permitted to provide entertainment or social music like civilian musicians would. The guidelines permit only one band or choir to be present at an event. The policies also require that the lodging, travel and meal costs for all units be covered without any additional contributions from the Government. In case of a need to have Air Forces participating at an event, a request can be made via DD Form 2535, Request for Military Aerial Support. The form is used to request U.S. Army Golden Knights, U.S. Navy Blue Angels, or U.S. Air Force Thunderbirds participations in any events throughout the U.S. or worldwide. A fillable up-to-date December 2016 edition of DD Form 2536 is available for download below. How To Request Army Support? Every state has its own Armed Forces and separate laws that overlook the process of requesting their participation in an event. The rules listed below apply to most states. However, we strongly recommend contacting your state National Guard or Defense Department through their respective websites for specific information and applicable legal guidelines prior to submitting your request. Make your request using form DD 2536 or DD form 2535 no later than 90 days before the event takes place. The chances of your application being approved will be greatly reduced if the request is received less than 90 days before the event. Any requests made within less than 30 days will not be considered. On average, it will take from about 14 to 21 days to process a participation request. Obtain a copy of the required form and fill it out completely without leaving any boxes blank - these forms require as much information about the event as possible to be approved. Provide the information about the place of the event or activity, its address, program, expected attendance and admission fees - if any. Be sure to list any sponsoring organizations, fundraising opportunities and whether or not the event can be considered political, religious or ideological. 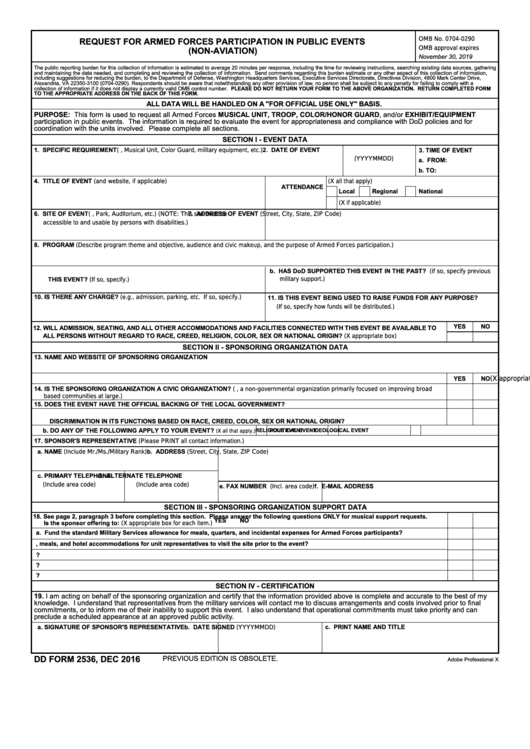 Section III of DD Form 2536 is filled only when requesting an Army musical unit. Submit all paperwork to the appropriate address listed on the back of the form, unless other laws are applicable in your specific state. Some local Defence Departments call for the forms to be sent directly to their representatives.